Back in September I wrote I was in danger of becoming a fiber junkie. Well, it’s confession time. I am a fiber addict. And Maggie is my dealer/enabler. It’s all her fault for creating such irresistible yarns. 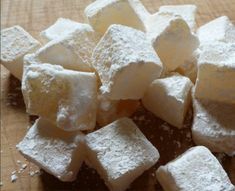 Hopefully, my family won’t be forced to put me in rehab. I know I’ve told you about my friend Maggie before, but I’m going to tell you about her again. 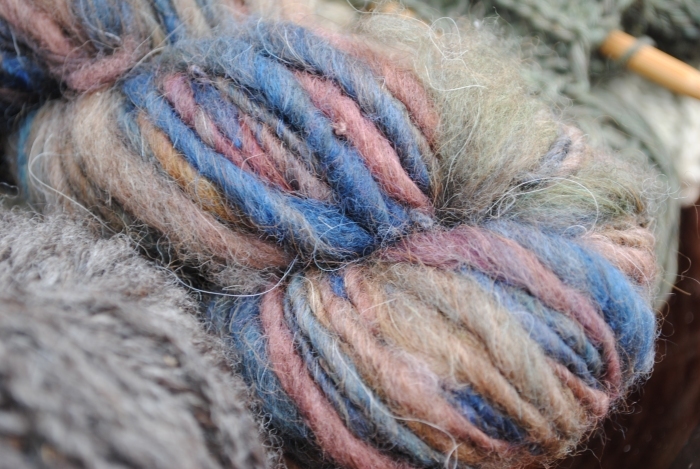 She currently owns 4 different spinning wheels, and is turning out some of the most amazing art yarns I’ve ever seen. On a daily basis I’m forced to restrain myself from spending the family’s weekly budget on the items she lists in her Etsy store. Pictured above is a ball of deep dark chocolate llama and alpaca wool that I got from her a couple of weeks ago. It’s so soft, bouncy and lush. The skein was really big, so I’m in the process of knocking out a quick pair of ballet flat slippers for myself. I may use the rest of it for a pair of socks for one of the boys… or maybe a hat. 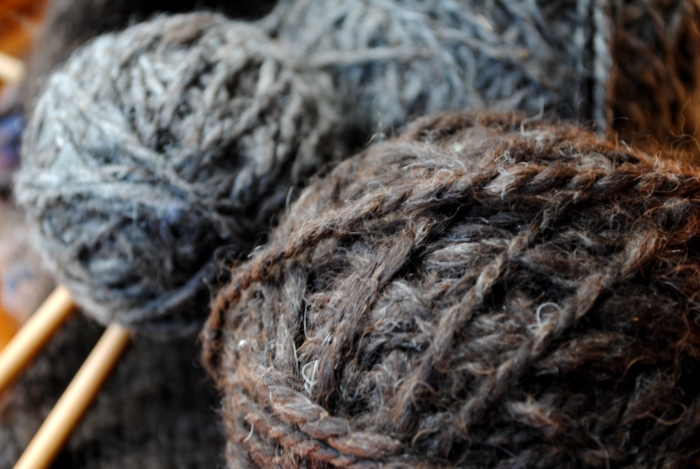 I had a very difficult time getting a shot that would do justice to the rich brown color of the yarn. This was the best I could do. I did not buy the yarn pictured below, but I really, really, REALLY would like to. I’m trying hard to be a good addict and told myself no. I wanted to show you a good example of why Maggie’s yarns are so hard for me to resist. I didn’t take this picture. It was shot by Maggie’s significant other, John, who is a photographer. 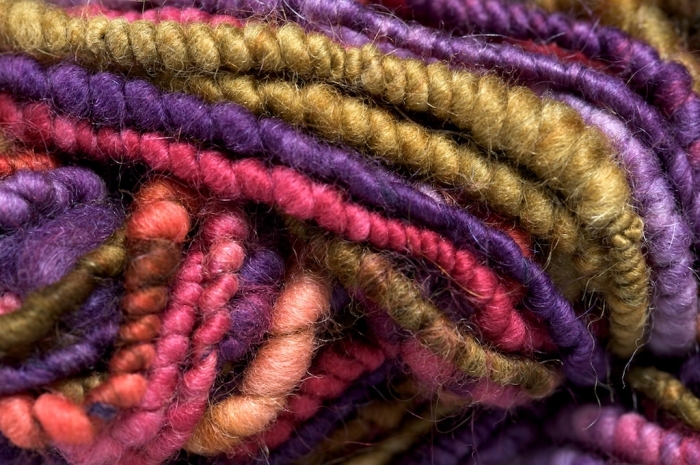 You can see more shots he took of this gorgeous yarn on his blog. This is a pair of felted slippers I finished recently using the 50% Jacob wool and 50% alpaca I got from Maggie back in September. 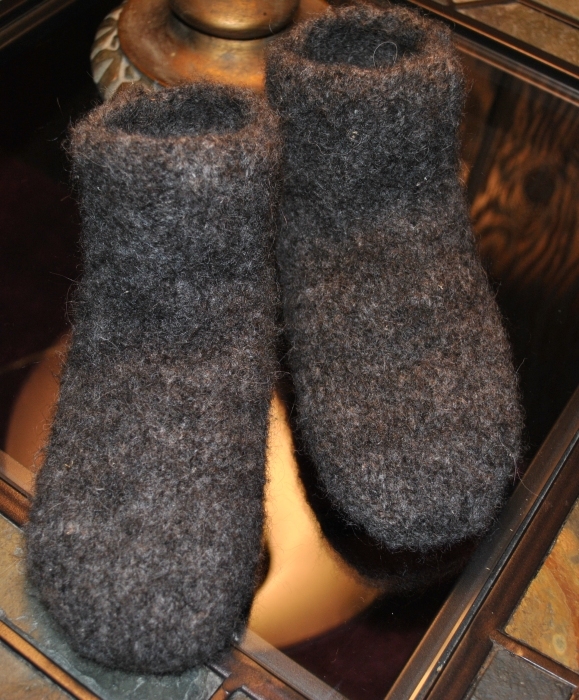 It was my first felting project, and I will admit to being a little scared when I threw those wool slippers into hot water in the washing machine. I was so amazed when I pulled them out and they weren’t ruined. I’m so pleased with these little ballerina slippers I made as a gift for my young niece (Rachel, make sure you don’t spill the beans, please). I knitted them with a wool/silk blend that Maggie solar dyed this past summer using madder root. 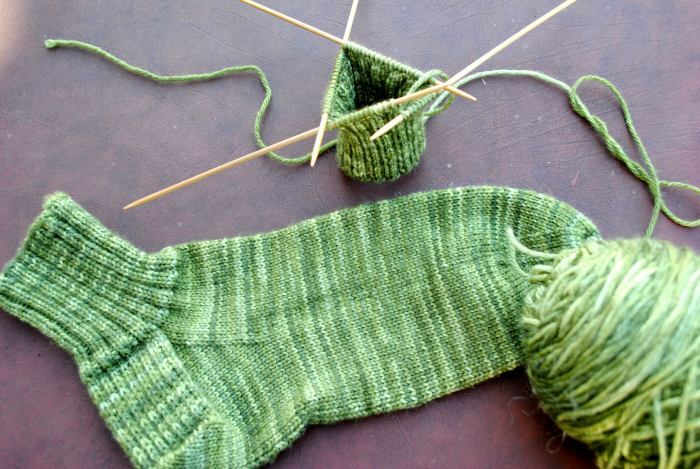 I found the pattern in a new book I picked up, Knit a Dozen Plus Slippers. The pattern gave instructions for knitted i-cord ties, but I decided I wanted to use ribbon instead. I thought my niece might appreciate a slightly more authentic looking ballet shoe. After all, hasn’t every little girl imagined herself as a ballerina at least once? I know…. two posts in one day, so sue me! Today is a cool drizzly day that has me reaching for a cup of hot tea, and I’m in the mood for some show and tell. I just found some of the most wonderful yarn in my mailbox. I got it from my friend, Maggie, owner of Prairieland Herbs. 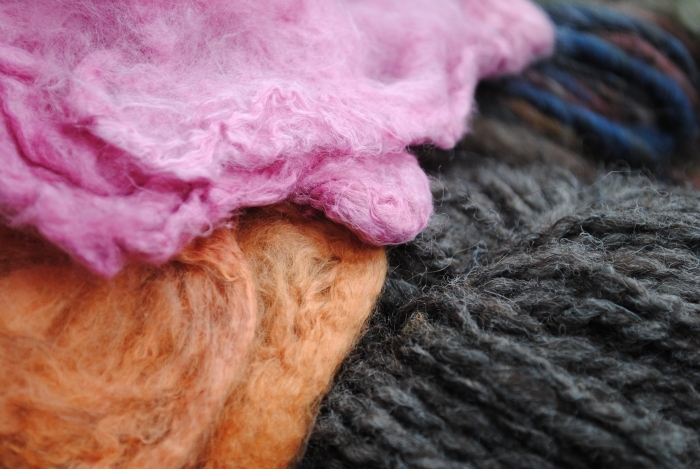 Maggie is also a fiber artist who manages to spin and dye fibers in her “spare time”. She sells some of her work from an Etsy shop, a place, I’ve discovered, I’m going to need to be VERY careful about visiting. Apparently, I’m in danger of becoming a fiber junkie. Look at this! Isn’t it gorgeous stuff! Maggie calls this Lapsang Souchong (which just so happens to be the tea I’m drinking). 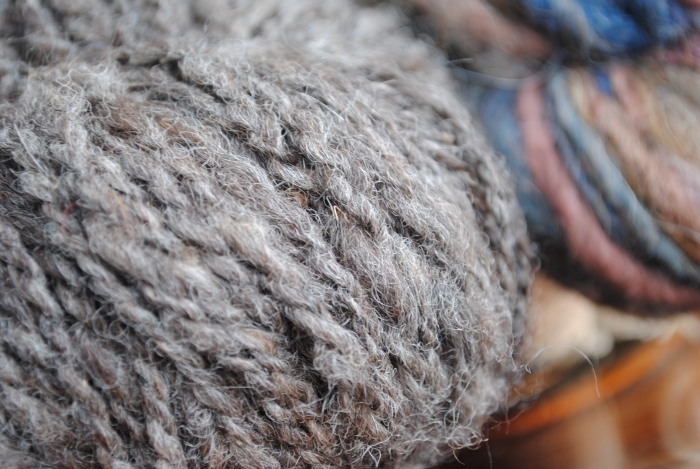 It’s a gorgeous natural steely grey yarn, spun from 50% Jacob wool and 50% alpaca. I had no clue what I was going to do with it, but Maggie suggested it would be fantastic for a pair of felted slippers. I’ve never felted before, and I’ve never made a pair of slippers, so it looks like I’m about ready to hit another learning curve. First I need to find a slippers pattern I like. Any suggestions? I’m so in love with this yarn! Maggie calls it Gimli. It’s a 50/50 blend of dark romney and alpaca wool. It’s a natural brown color overdyed with deep forest tones of rust, brown, forest green, navy and slate. I’ve got to decide on something special for this. Maggie included a couple of silk hankie freebies with my yarn. I didn’t know what silk hankies were, so I had to look it up. I just learned to knit last winter, so I’m still a noob. I read that the silk can be incorporated into the wool, but I couldn’t find any specific instructions. The pink hankie was naturally dyed in cochineal, and the orange was dyed in madder root. More for me to learn!